Picking a screen story apart is what bored people do. When a television show is firing on all cylinders, the audience is entertained, and its ability to suspend disbelief expands to the point that flubs feel intentional and errors seem like triumphs. “Time Shall Unfold” is limited by the fact that it’s an episode of Empire, a show that has repeatedly torched whatever goodwill it has built with its audience. But that’s just about the only thing limiting “Time Shall Unfold,” which, like “My Bad Parts” and “Death Will Have Its Day,” demonstrates Empire’s ability to suddenly become its best self. The unexpected flashes of brilliance are especially surprising here, considering how far Empire has wandered off its path. There’s no way any of this should work, but somehow most of it does, even while the show continues in the same baffling direction. That’s no minor feat. Credit is due to Ayanna Floyd Davis, the former Hannibal writer who gets her script credit since joining Empire for season two. She has a strong grasp on what Empire’s tone should be, and when a nighttime soap has a perfectly calibrated tone, it feels over-the-top without feeling stupid. It makes the viewer feel like the storytellers respect the audience even as they toss out the most ridiculous ideas imaginable. And listen, there are as many ridiculous ideas in “Time Shall Unfold” as in any Empire episode. One of them is the long-awaited reveal of Anika’s pregnancy, which winds up being the sole purpose of having Rhonda accept Anika’s invitation to stay at her place. Another is the shareholders’ meeting, which in Empire becomes equal parts artist showcase, keynote address, and gladiatorial trial-by-combat. Then there’s Jamal’s sudden musical infatuation with Freda Gatz, but of course, the most ridiculous idea of all is the revelation that all this time Lucious’ purportedly dead mother has been keeping a rocking chair warm at an elder care facility. But if you look past the potential of the Leah reveal, which could and probably will wash out as quickly as any other story this show has told, there’s a classically soapy twist that’s well-executed. ”Time” finds Lucious riding high on the success of the raw, emotional “Boom Boom Boom Boom” video, which the world readily embraces instead of recognizing that the song is terrible and that Lucious is oversharing. Meanwhile, Andre wants to visit his grandmother’s grave and talk to the only relative who can truly understand his plight, even if she can’t talk back. This show is generally bad at linking actions to their consequences, so what does it ultimately mean that Leah is still alive? Well, that’s anyone’s guess. Presumably the revelation will drive a wedge between Lucious and Andre, though that ship is no longer visible from the port, and I suppose could turn the support Lucious has gotten from the video into a backlash just before the all-important ASAs. The stakes and implications aren’t sharply defined, but it’s a much sharper story than Empire has told in season two. But more important than that, “Time” works shockingly well on a scene-by-scene basis. 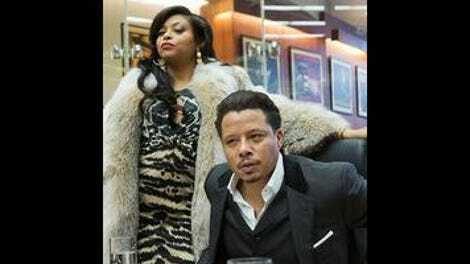 When Lucious confronted Anika about the pregnancy and they attempted to hash out their issues, I said aloud “This is the version of Empire I want to watch.” I would watch the hell out of this show if all of it was like that scene, or like the scenes between Andre and Rhonda, or like the skirmishes between Lucious and Hakeem. I would talk about this show all the time and pressure people into watching it. It’s just solid nighttime soap storytelling. Lucious’ coup at the shareholders’ meeting reminded me of one of the many board meeting ambushes in Melrose Place when somebody at D&D gets humiliated in front of an important client. The build-up is perfect. Lucious tries to rattle Hakeem and fails, then tries again to undermine him by relaying the personal stories of individual Empire shareholders as if he’s giving the State of the Union address. It’s absolutely ridiculous, but I loved it. No single episode can vault Empire out of the hole it has dug for itself in season two. There’s still the larger issue that the main narrative thrust of the show—the battle for supremacy and control of Empire—has lost all of its meaning. I’m glad that cash-strapped teacher can expect more consistent dividends when Lucious returns to the head of the company, but it’s clear by now that it never matters who’s running the company. The stock never tanks (at least without instantly recovering), the company’s direction never changes, and no one ever goes broke or does themselves lasting professional damage. Hell, even the new Empire logo, made in Hakeem’s image, doesn’t appear to have made it into the boardrooms or the building’s exterior even when Hakeem is still actively running the company. As exciting as it is to see Andre ready to mix it up again after spending such a long time sidelined by his illness, I wish there was a more interesting game for him to jump into. Whatever narrative value there initially was in the battle to control Empire, it’s no longer there. I also have no clue what to make of the Freda Gatz story, which hits some vaguely romantic notes as Jamal quickly realizes that Freda is his muse and that he can’t perform at his best without her by his side. Empire moves fast, and complaining about how fast it moves is still valid and still a waste of everyone’s time. But there just haven’t been enough steps between Freda working at Lucious’ right hand, then agreeing to work with Jamal, then becoming such an integral part of Jamal’s creative process that he literally can’t perform without her in the studio. None of it seems important when I still don’t follow Cookie’s logic with regard to the threat Freda allegedly poses. 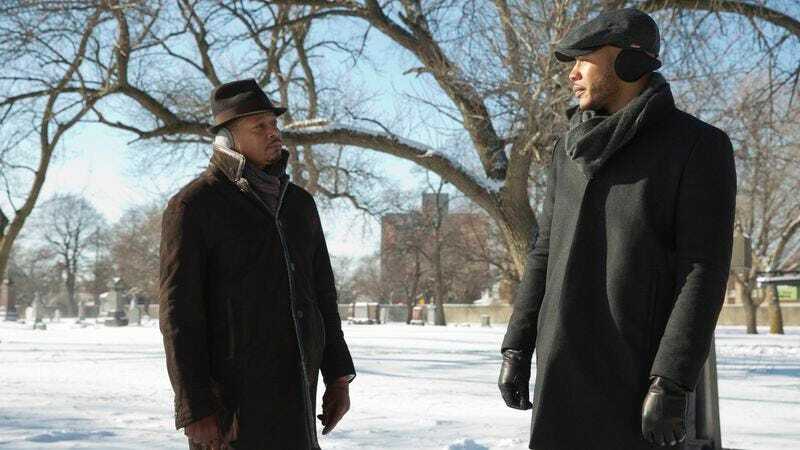 If the goal is to protect Jamal and Hakeem from Freda, one would think the best move might be allowing them to build a friendly, working relationship with her so that when Lucious’ involvement in Frank’s death is inevitably revealed, she’ll be less inclined to hold the sons responsible for the sins of the father. Instead, Cookie arranges for Jamal to work with the estimable Stacy Run-Run, whose exclusivity clause prevents her from being outshined by another female MC. Maybe the best way to keep Freda happy is to, I don’t know, stop asking her to be involved with Empire projects only to boot her off of them? Still, “Time” works surprisingly well, well enough to show that Empire is still theoretically reparable. Maybe season three is where the rubber truly meets the road. Short of literally having a wizard appear and wave his wand, I can’t think of a lazier or more abrupt way of erasing Lola from the Lyon family. And how does Lucious know the father’s name? DNA tests give you that much information now? So many questions. One Lucious question is now solved though: The dude can teleport. First he appears in the bathroom with Camilla and Mimi, and now he’s just hanging out on Anika’s couch. Speaking of Anika, I’m going to assume she bought that pad with family money, because she hasn’t mentioned anything about gainful employment for like seven years or so. Exactly what was Andre taking responsibility for in that brief aside to Rhonda at the shareholders’ gladiator dome? My read was that Lucious was responsible for the theft of the clothing line and the issues with the Tiana/Mirage A Trois tour, but Andre was somehow responsible for derailing the SwiftStream app. I guess. I don’t really know anymore. Leslie Uggams though! She couldn’t look less like Kelly Rowland, but fine.